SNHR issued its periodic report concerning the documentation of massacres by all conflict parties in Syria. The report indicated that since the start of the cessation of hostilities agreement, various Syrian governorates witnessed noticeable retreat relatively good, compared with the previous months since March 2011 in murder rates , and the main talk is about the areas under the control of the armed opposition; because the rest of the controlling areas such as those under control of the Kurdish Democratic Union Party and the control of the Syrian regime, are not exposed to the dense daily bombardment which leads to killing at least 60% of the victims, destruction of buildings, and the displacement of its people. But in spite of that, the violations did not stop, mainly by the Syrian regime, which seems to be the greatest sufferer of the continuation of the cessation of hostilities, in particular, the extrajudicial killing and the most roughest the death under torture which confirmed that maybe there are partial stopping of cessations hostilities but other crimes still ongoing as they cannot be notice by Russian and American mediators. The report presented the statistic for massacres in March 2016. The report described an incident as a massacre if it involves the killing of five unarmed people at least. SNHR documented 21 massacres in March 2016, detailed as follows: government forces committed 11 massacres, ISIL committed 3 massacres, one massacre by each of armed opposition groups committed and Russian forces and international coalition forces. 4 massacres were committed by unidentified groups. According to the report government forces committed 3 massacres in Damascus suburbs, 1 massacre in each of Aleppo and Idlib, 2 massacres in each of Homs, Al Raqqa and Dier Al Zour. The Russian forces committed one massacre in Al Raqqa. ISIL committed 2 massacres in Deir Al Zour and one in Aleppo. The armed opposition groups committed 1 massacre in Aleppo. The international coalition forces committed one massacre in Aleppo. As the report recorded 2 massacres in Deir Al Zour in one massacre in each of Dara’a and Al Hasaka by unidentified groups. The report indicated that those massacres killed 204 individuals including 51 children and 39 women. 42% of targeted victims were women and children which is a strong indicator that civilians were targeted deliberately. The report detailed the massacres committed in March as follows: government forces killed 132 individuals including 35 children and 25 women, Russian forces killed 5 individuals including a child, ISIL killed 18 civilians including 2 children and 3 women, armed opposition groups killed 6 civilians including 3 children and 3 women. The international coalition forces killed 12 individuals including 2 children and 5 women, and the unidentified groups killed 31 individuals including 8 children and 3 women. The report affirmed that the bombing, whether it was deliberate or indiscriminate, targeted armless civilians, thus, government forces and its militias have violated the articles of the international law for human rights which guarantee the right to live. Furthermore those violations were perpetrated during a non-international armed conflict which can be classified as war crimes. The report indicated that those attacks, especially aerial bombing, have caused immeasurable humanitarian and material losses. There are strong indicators that prove that the damage was deeply severe compared to the expected military advantage. 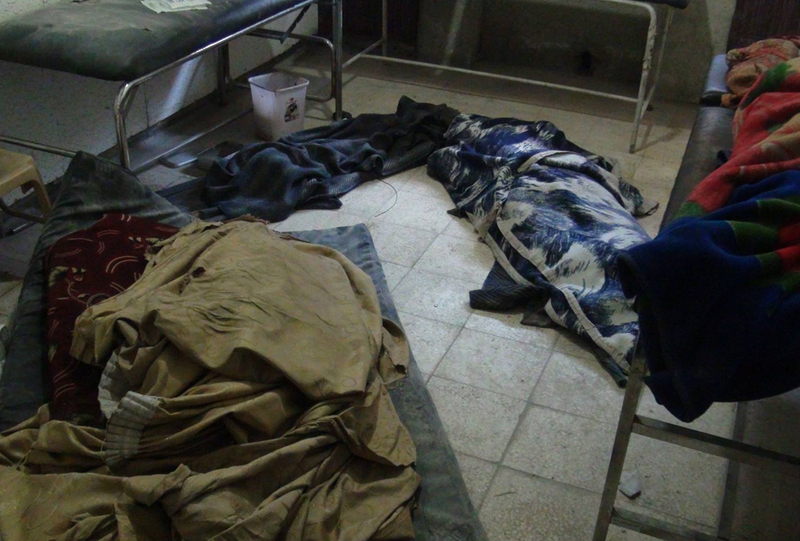 In all of the cases, SNHR didn’t find any military targets before or during these attacks. The report recommended The United Nations and the Security Council to transfer the Syrian issue to the International Criminal Court and stop the disrupting of the decisions that must be adopted by the Security Council against the Syrian government. That disruption is a wrong message to all dictatorships around the world and an enhancement to the culture of crime and to pose urgent punishment on those who are involved in the violations of human rights. It also demanded to bind the Syrian government to allow all relief and human rights organizations to enter Syria, in addition to the International Investigation Committee and allowing them to work freely. The report indicated that it is necessity to List the militias that are fighting with the Syrian government and have committed massacres, like Hezbollah and the other Shiite brigades, National defense Army and Shabiah militia, on the international list of terrorist organizations. Finally it demanded the implementing the principle of “protecting civilians” adopted by the General Assembly in 2005, in Syria now, as the situation there is direly requiring the implementation of such a principle.